At the 10th anniversary celebration of the Maternal Health Task Force, The Global Maternal Health Symposium, we awarded 10 Maternal Health Visionary awards to professionals who have shown impact, innovation, inspiration, leadership, and future vision in the field of Maternal Health. This blog series highlights the work of these maternal health visionaries. Hawa Abdullahi Elmi is passionate about the importance of midwifery services for reducing maternal and newborn morbidity and mortality, particularly in her country of Somalia. “Midwives can provide proper care before pregnancy, during childbirth, and after delivery. They can identify problems, undertake life-saving interventions and strengthen the referral system to the referral hospitals,” Hawa says. Hawa has dedicated her career to supporting and promoting midwives, and she now serves as the Principal of the Mogadishu Midwifery School and the Vice President of the Somali Midwifery Association. One of her most recent achievements is her active role in the development of nationally and internationally-recognized Somali midwifery curriculum in 2016, which has been instrumental in the training of over 250 qualified midwives. Hawa’s interest in maternal health began when she was a nurse-midwife student at an SOS Community Health Nursing School in Mogadishu (a missionary school founded by the late Italian nun Sister Leonella Sgorbati in 2002). Following graduation, Hawa attended a two-year course of medical education in Nairobi and eventually took a position as a teacher at the same missionary school she attended. Her skills as a leader and her commitment to improving maternal health were soon recognized. In 2012, she was appointed as the principal of a new midwifery school established in Mogadishu by the Somali Ministry of Health. The aim of this midwifery training program was to reduce the maternal mortality rate in Somalia, which was approximately 1,044 deaths per 100,000 live births at the time. Noticing the number of women who came from outside the city to seek care for birth complications, Hawa realized there was an urgent need to increase the number of skilled birth attendants in rural areas. In her new role, Hawa carried out an assessment survey with the Somali Ministry of Health. They identified only 25 midwives in an area with a population of five million. Not only was there a vastly insufficient number of midwives, the few practicing midwives were at the end of their careers. Hawa set out to recruit young women from around the country to attend midwifery training. She began advertising in rural areas and found that many young women were willing to pursue a career in midwifery. “If we ask them why they are interested in becoming a midwife, most of them will say, ‘When I was young I witnessed a problem with maternal health and complications in my family.’ Some of their mothers passed away due to maternal health complications that could have been prevented with timely quality midwifery services,” Hawa explained. As principal of the Mogadishu Midwifery School, Hawa has helped hundreds of women receive midwifery training. Women who are interested in attending midwifery school must undergo an exam, and those who attains high scores are invited to free midwifery training course. They are also provided with full accommodation and access to training and learning resources throughout their course. At the school, women attend several semesters of training in areas such as family planning, prenatal care, delivery, postnatal care, risk assessment, gender-based violence, mental health and management. 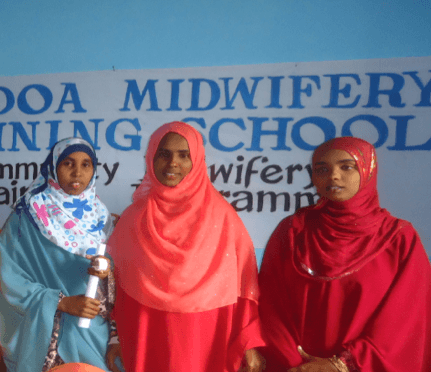 Hawa believes these efforts to increase the number of trained midwives in Somalia have helped to reduce the maternal mortality rate, which has fallen to 732 deaths per 100,000 live births according to a 2016 report. Although tremendous progress has been made in increasing the number of qualified midwives in Somalia, many challenges remain, Hawa says. Somalia remains one of the countries with the highest maternal mortality rates in the world. The number of trained midwives in the country still falls short of World Health Organization recommendations, which suggest that Somalia needs an additional 20,000 midwives. In addition to training more students, “we want to improve the quality of teaching, strengthen the Midwifery Association, increase regulation, and establish an online library to enable midwives and students access to updated information” Hawa says.